London gets a makeover in this vegan artwork as London is recreated using fuit and vegetables to celebrate the launch of The Good Food Channel. But is it art? Lets hope Life imitates art and Londoners really gets a taste for fruit and veg. A group of health professionals gathered a group of diabetics and sucessfully reversed their diabetes just by eating vegan wholefoods. 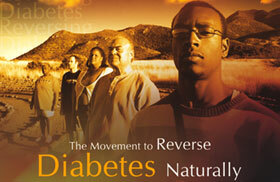 Take 6 people and reverse their diabetes just through Diet? Processed food is killing people. If you really want to get well then try this approach, if it doesn't work what have you got to lose? You'll still be on the drugs. You'll still be ill. If it does work, with the supervision of your doctor you can gradually wean yourself off any drugs that you don't need any more.